Stream anime episodes for free, you want to Watch Fairy Tail Episode 52 English Subbed online for free. 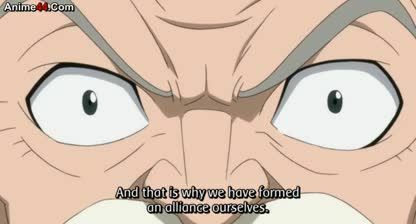 Episode guide Fairy Tail Episode 52 English Subbed Allied Forces, Gather Up! Fairy Tail is joining up with other guilds – Blue Pegasus, Lamia Scale and Caitshelter – to defeat a dark guild named Oración Seis. These four guilds will each send out members to strike the six members of the Oración Seis down. From Fairy Tail, Natsu, Lucy, Gray and Erza are chosen. They are sent to Master Bob’s villa (from Blue Pegasus) to meet up with other members of other guilds. They first meet the representatives of Blue Pegasus, the Trimens – Hibiki, Eve and Ren – and Ichiya. Afterwards, they meet Lyon and Shelly, whom they fought with before, and Jura from Lamia Scale. The episode ends with everyone surprised upon seeing Wendy from Caitshelter, a petite girl who arrives last.